Flat packed polythene disposable aprons are ideal for us within the food industry, with electronics, veterinary practices, hospitals, laboratories, general medical applications, the printing industry and the manufacturing industry. They are packaged flat packed within a outer dispenser pack for easy dispensing. Also available in Blue, Green, Red and Yellow. Also available as rolls of 200 aprons. 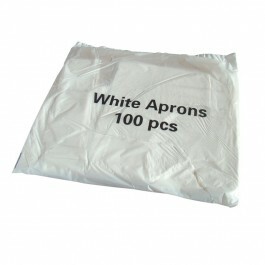 Sold in packs of 100 aprons. Full case pack size - 10 packs of 100 aprons.